They should have a sign up outside Umaiya — literally, “delicious house” — informing patrons that the one thing that is not on the menu here is choice. But for that to happen, menus would first have to be made. Umaiya is a one-stop shop, as well as being an anti-choice eatery. You come here for takoyaki. the bijou octopus dumplings that might well be Osaka’s most famous and favorite savory snack. Umaiya is old-school; there are no innovations here, and furthermore there’s no mayonnaise, so don’t bother asking for it. 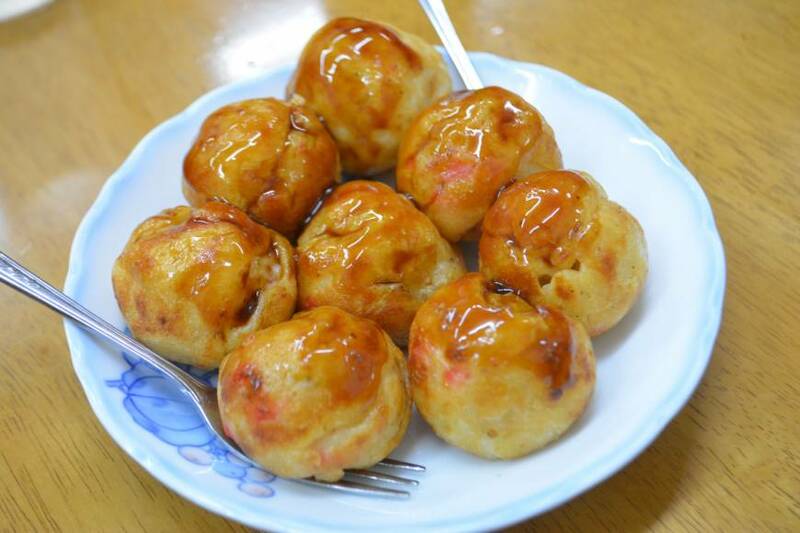 Instead you get a serving — the minimum serving is eight, and it’s one order per person if you’re eating in — covered with a thin glaze of takoyaki sauce. And that’s it. In spite of, or perhaps because of its minimalist approach, Umaiya has made it onto Michelin’s list of where to eat in Osaka — it has a Bib Gourmand. You get the feeling that Umaiya just shrugged its shoulders at the news. With takoyaki and its sibling, okonomiyaki, success or failure lies in the batter. Umaiya goes for the al dente approach. 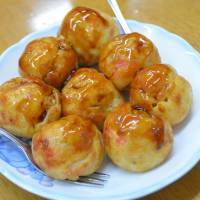 I have definitely had, and made, takoyaki that have a softer shell. Umaiya prefers a more robust crust. Umaiya is located on the western end of Tengo Nakazaki-dori, a covered shōtengai (shopping arcade) that’s packed with great little restaurants. There’s a modest space inside Umaiya to sit down and drink a beer — there’s only one type — and enjoy a plate of these unfussy snacks.